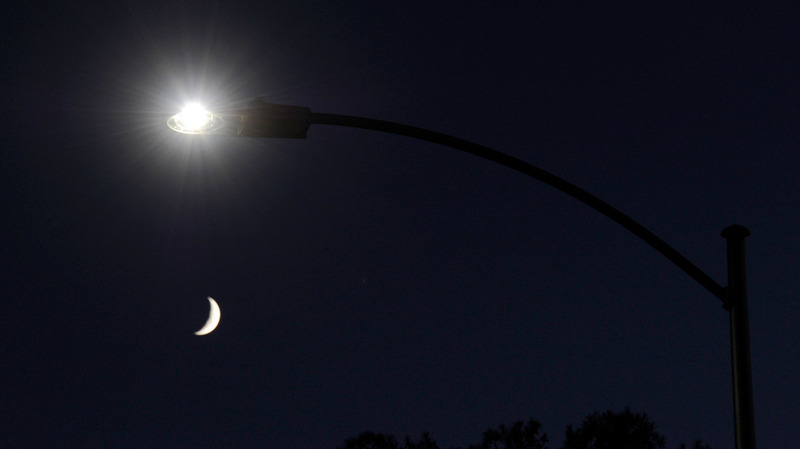 Bright, Bluish-White LED Streetlamps Disrupt Sleep Cycles, AMA Says : The Two-Way The American Medical Association says some energy-efficient streetlamps interfere with circadian rhythms and also cause glare. It recommends that towns choose less intense, warmer-colored lights. A waxing crescent moon is seen behind a streetlight with a newly installed LED fixture in 2011 in Las Vegas. The city was replacing 6,600 existing lights with the energy-efficient LEDs. It has since replaced tens of thousands more. At its annual meeting last week, the AMA officially urged communities to be careful, if they choose to install such lighting, to avoid the most intense lights and choose the least-blue option available. In an unpublished report, the group specifically recommends warmer "3000K" LED lights, rather than harsher "4000K" options. It's also important to properly shield the light, according to the AMA's guidance. Bright, blue-rich LEDs cause glare and "decrease visual acuity and safety," which can create road hazards, it says. These LED streetlamps emit a blue-light wavelength that suppresses nighttime melatonin production more than any other color of light does, the AMA says. Meanwhile, surveys have found that brighter nighttime street lighting "is associated with reduced sleep times, dissatisfaction with sleep quality, excessive sleepiness, impaired daytime functioning and obesity," the group writes. The impacts of blue light on circadian rhythms have been widely reported before, including by Harvard Medical School and NPR's Shots blog. The medical association stopped short of warning cities to avoid LED lights altogether. The U.S. Department of Energy is encouraging municipalities to switch to LED lighting, to take advantage of their energy savings. Scores of cities and towns around the country have already replaced at least some of their streetlamps with LEDs — including Las Vegas, Los Angeles, Seattle, New York City and New Orleans, as well as dozens of smaller communities.